In the past we've had many cases where a client would request a corporate identity (logo) but prefers a logo without an icon or graphic, in other words only a type logo. It is hard sometimes to come up with a type only logo that is striking, different and shows unique personality, and should still represent professionalism in a certain industry. If you are used to providing symbols and iconic reference to an international platform that relies on icons and symbols as language, you might feel the same. Sure, you can just type it out in the boldest typeface you’ve got on your computer, splash a bit of colour here and there, change the case, tweak the kerning, leading and size, and there’s your logo. But you run the risk of it disappearing in the vast sea of logos that will all look exactly the same. So, what then is the solution? Well. Use what you’ve got. Let’s start with something you have to do anyway. First, draw up a short synopsis of your client, regarding their company type, industry, location, personality, products and/or services. Then, identify the broader industry your client belongs to: their competition, competitive products or companies, any external influences on their trade. Also, analyze these companies’ corporate branding, colours, logotype, style, personalities etc. Lastly, identify their target audience, the market. Look at their behavior, their needs and their geographic, psychographic and demographic background. Now you will be able to have a pretty good picture of how to visually capture the client’s business character. Keep this information at hand for the following steps. In a new document in your vector application software, type out your client’s company name in black and search for the various typefaces that might work. Keep the options to a minimum. Now, observe the word(s) and look for distinct shapes in the characters, similar characters, rhythm created with strokes or curves – basically any elements that you can work with. In essence, you need to break it down and forget that it is text – you should see design elements such as shape, line, form etc. Observe the strokes and change the lengths of your ascenders and descenders, to create vertical rhythm, or align them, or even extend them longer than usually. Look at your counters and bowls and see if you can repeat the shapes or play with the negative space. If you have any repeated characters, see if you can use them to your benefit. Don’t forget about characters that mirror each other such as “p” and ”q”, “b” and “d”. Create ligatures from characters that allow you to. If your typeface allows this, you can merge the characters together. Your typeface weight can be adjusted to create focus or emphasis on certain words or characters (e.g. using bold and regular together, the section in bold will be more prominent and draw more attention). Serifs or details can be manipulated and duplicated in many new ways and applied to other characters in order to create consistency. Placement of words or characters in relation to one another can be adjusted. Adjust the size of words or even certain characters, to help create focal point or emphasis. Adjust the tracking, kerning and leading to get the right visual balance. Apply the correct colour(s) to the logo. This can also help with the personality of the logo and create focal point or emphasis. Before you continue, look through each character and design application to make sure that all fits together nicely and that you have good balance and harmony in your logo. If you feel the need, make the changes. It doesn’t help to end up with a logo that has been reshaped in so many ways that it is illegible. If you have to take a step back, that is OK. And make sure that the change is justifiable and necessary. Then, marvel at your unique new logo! Here are a few basic examples of what can be achieved. 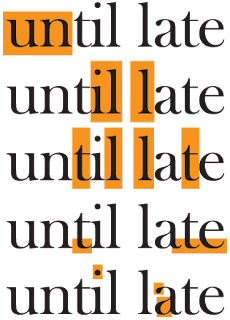 Compare the final product with the typeface shown in the beginning to see the difference. Adjusting the kerning to have a tighter fit. Removing the “r” and replace it with the left half of the “n”. 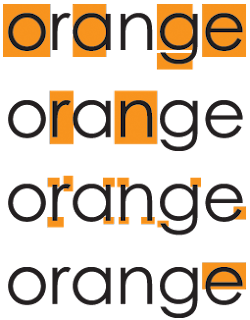 Duplicating the eye of the “e” and using it as leaves to suggest an orange with the ”o”. Rotating the “e” 45 degrees to duplicate the diagonal lines created by the leaf. Cut the curved stroke of the “e” to end horizontally, similar to all the other stroke ends. Tail of “t” duplicated and applied to “n”, “i”, “l”’s and “a”. The top curved serif on ascender of “t” applied to “l’”s. Adjusting the kerning to attach characters to one another. “u” duplicated, rotated and replaced the “n”, combining the “u” and “n”. Tail of “t” duplicated, rotated and applied to “u”. Counter of “a” duplicated, rotated and used for dot on “i”. Length of the 1st “l” adjusted to simulate a curved upward movement from the “t” to the last “l”, also to complement the new dot on the “i”. “i” replaced by new “l” cut shorter to align with “t”’s horizontal stroke. New “l” duplicated, rotated to horizontal position, duplicated and rotated again and aligned to create underlining. Application of two complementary colors to differentiate the words from each other. Horizontal stroke of “K” replaced by “J”. 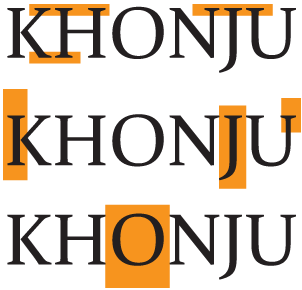 Characters moved closer and serifs of “K” and “H” attached, as well as that of “N”, “J” and “U”. The “O” made bigger, to create emphasis. A dot for the “J” added, and counterbalanced with a dot under the “O”, aligned with the tail of the “J”. To make it look more classic and to give it depth, the word has been duplicated, adding a thick stroke and punching the stroke away, only leaving smaller bits of the characters to overlay slightly off center on top of the original. Finally the colours are added, with a lighter colour on top to simulate a highlighted effect. I really like we have bookmarked your internet blog for brand new things to check out email on the highway. Excellent Job i really enjoyed reading your post thanks for sharing. Great tips you have shared about the logo design, which is most important for our corporate business. Thanks for sharing this knowledgeable post. The post is written a very good manner and it has lot of useful tips for your followers and readers.Thanks for sharing the useful information about Logo designing. Thankyou for sharing some useful tips.